Synopsis: "Before you stands the future." This book is Matched by Ally Condie crossed with Delirium by Lauren Oliver. 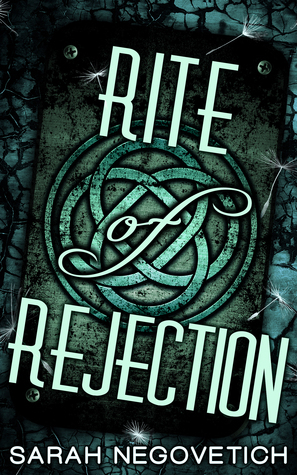 Rite of Rejection has renewed my faith in self-published novels. Generally, I avoid them because they are not normally submitted to the same amount of editing and revising that books published by a big publishing company are. In this case, I'm wrong. It's a dark dystopian novel where all the teens have to go through the ceremony of Acceptance before they are officially a member of society, except that the ceremony is corrupt and it's not just the criminals and low-lifes that end up in the Pit. It's a pretty dark book but it has an interesting plot and is well-written. The ending--although unique--is a bit unsatisfying but I read on the author's blog that there might be a sequel (big might) so my fingers are crossed. 1) The basic plot of the book is very interesting. As I said in my intro, it's Matched crossed with Delirium. The main difference is that it's not the protagonist's love interest that winds them up as an outcast of society. 2) There is strong character development especially in Rebecca (protagonist). She starts out as straight-laced, ordinary, law-abiding, scared girl but develops into a strong character that even though she has ones she can depend on is able to stand up for herself. 3) I like the couples in this book. There are two main ones, one that is a homosexual one that hides for most of the book, although I thought it was as clear as day from the beginning. Then there is a interracial couple. I'm so glad that author's are finally starting to write about more than just white heterosexual relationships. It gives me more faith in our world. Getting back to the book, I have found a lot of books when they try to do this that they put so much emphasis on the difference of the couple's race or that they've written a homosexual couple that it takes the focus away from the actual relationship. Instead it's focuses on how their relationship is not acceptable in society. Although that's understandable and realistic, authors often spend too much time on the social issues aspect of the couple's relationship instead of the relationship itself. This is true in real life but in a book, for me to root for any couple, I have to know each of the characters individual and see how are are together. Rite of Rejection does just that. 1) I found that the main twist of the novel was fairly predictable. It was supposed to be shocking and disturbing, and yet I wasn't surprised at all. 2) I go back and forth whether or not that I like the ending. Part of me likes it, the other part of me is wanting more. It's a unique ending but it doesn't give me any satisfaction. Basically, without giving too much away is that you have no idea what happens to all of the characters. Even though the book gives you hope for the future, you just don't know. I hope that Negovetich will write another novel, I read on her blog here that she has written a first draft but she's not sure if she wants to turn it into a full novel just yet. I hope she will though. 1) "The sheer force of will it takes my mother not to roll her eyes at me is astounding. Her facial muscles actually tense with the effort." 2) "Now you'll have time to make it home for a couple of hours of sleep and Cindy won't make you crash on the couch." "I think I'll pad my luck with a quick stop at the bakery. Nothing says 'please forgive me' like a butter croissant." 3) "When we get out of here, I'm going to take you on a real date." He grips both of my hands and his face is more serious than I've ever seen it, "As soon as we get settled, we can go out for a fancy dinner and dancing. I'll buy you a fancy dress, ten times nicer than the one you wore to Acceptance." 4) "I'm going to be a widow traveling with her sister. Of course, I'm heartbroken and you all feel horrible about my loss." She winks at me and smiles. "I'll wear black." 5) I grip his hand and pull it up to my cheek. His skin is rough but it feels like silk against my face. "Don't leave me." Daniel reaches behind him with his free hand and pulls a makeshift chair over next to my bed. "I'm not going anywhere." Thank you Netgalley and Sarah Negovetich for my ebook copy of this novel. WOW that sounds amazing!! I loved Delirium and crossed with Matched (also good)! Going to check it out, thanks for making me aware!